Optician advised best to go with two pairs…. One pair varifocal/progressive OFFICE lenses….for the READING and INTERMEDIATE…and another single vision pair for DISTANCE/GENERAL. I proceeded with the office pair initially, into a new pair of Ray-Ban frames. I am more than happy with the prescription and getting used to varifocals…it’s great being able to see again! !...but, there’s a moderate amount of visual distortion as I move my head about…but more importantly, they appear rather ‘bulbous’ on the lens front …. Photo attached. These were 1.67, tailor-made with a Clean+Clear coating. They make me look a little ‘goopy’ to be honest…luckily they are only for sitting indoors!! My question here is….. Given the slight disappointment with the first pair at 1.67….. do I need to go to 1.74 (or even double-aspheric?) 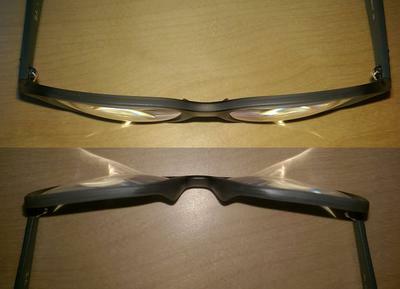 to ensure a much flatter/thinner, less bulbous lens front in the next pair? Or, as I suspect, that the reason the first pair is like this is because they are pretty much just magnifying glasses in a frame – and that my ‘proper’ prescription for general would be OK??? Can anyone offer me some good advice please? I’ve wasted small fortune over the years on glasses and more often than not end up disappointed. You have big diopters, especially for reading part, so being a + diopter, it is thicker in the center, this is why looks like that. The visual distortion is normal with varifocals, in the beginning, it will go away in time, but the thickness is about diopters, so 1.74 and aspheric is maybe the solution. Even if you make separate eyeglasses, the close vision eyeglass will have the same big diopters and thick lenses.